Evidently, I made a lot of salads with berries this summer that I didn't get around to posting. 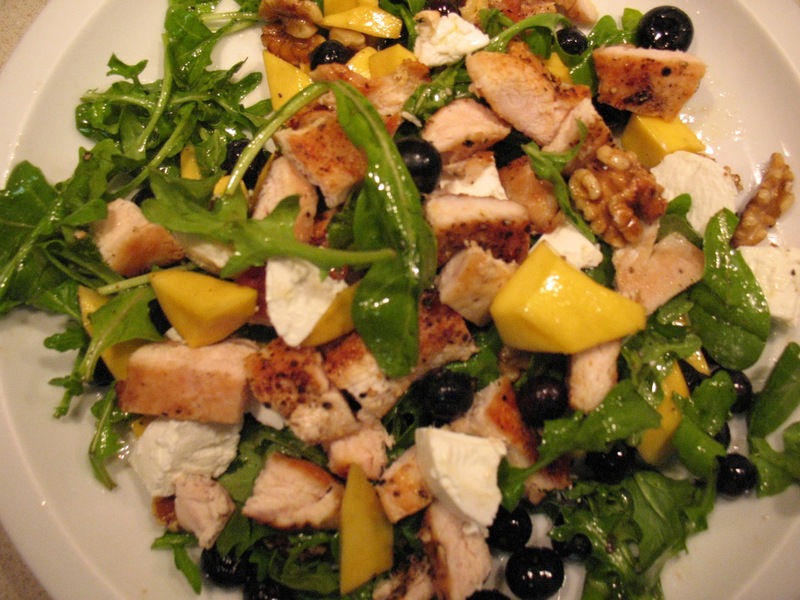 This is the last, which combines blueberries with mango, goat cheese, chicken and walnuts. 1. Heat olive oil in a medium frying pan over medium heat. Pat chicken cutlets dry, sprinkle with seasoned salt and pepper and sauté 10 minutes, turning over halfway through. Set aside and, when cooled, chop cutlets. 2. In a large salad bowl, combine arugula, mango, blueberries and walnuts. 3. Whisk together olive oil, honey, vinegar, salt and pepper. Pour over salad and toss to combine. Serve on plates topped with goat cheese and chicken. This was good! I'm so glad you now like berries.